By the time the Regency time period came around, sending letters to your special valentine was a firmly established tradition in England. While a few manufactured valentines were finding their way into shops, mass-produced, pre-printed valentines similar to what we see today (minus the cartoon characters) didn’t really make an appearance until the mid-1800s. Therefore, when our handsome heroes gave valentines to our heroines, they had to make them. 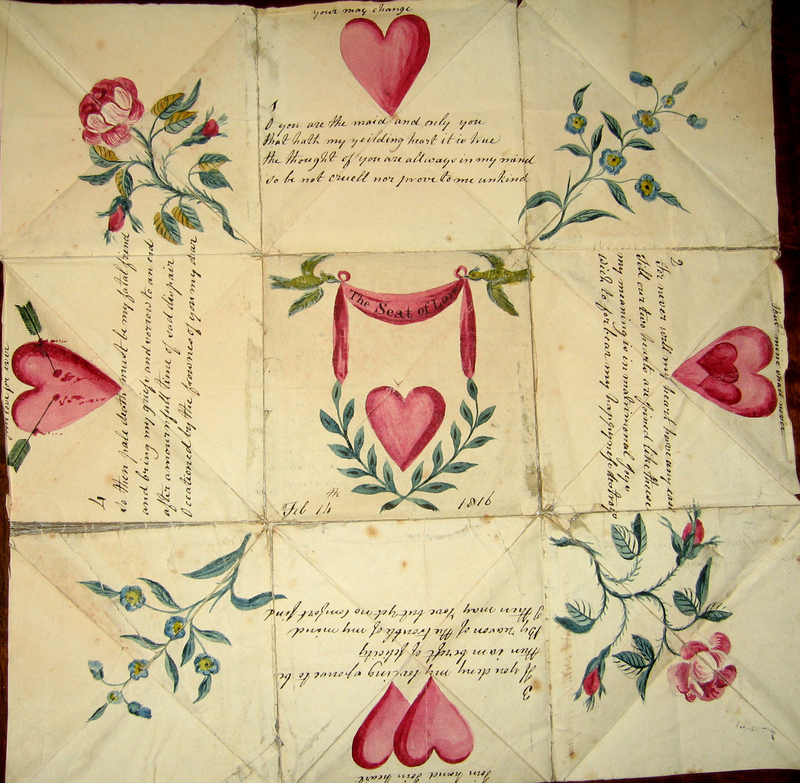 You can check out an article about antique valentines here. You can learn more about the particular valentine pictured at left here. I am a fan of the handmade valentine. I’m a fan of the handmade anything, really. The personal time and thought mean a lot to me. My oldest daughter is in preschool this year which means she’s going to have her first Valentine’s party. Since I’m making a deliberate attempt to make me and my family healthier this year, the last thing I want to do is send candy to 24 preschoolers and have the leftovers sitting around the house. I am also on a mission to clean out and organize my house so the second to last thing I want to do is send her to school with little pieces of meaningless, useless paper to go home and clutter up everyone else’s houses. So we made valentines. I got on the handy, dandy internet and started looking for non-candy, non-pointless valentines and I found these. I love these valentines! They are cheap, practical, and really easy for my daughter to put together herself. While the kids might not be excited about pink and purple pencils, I know there are some moms that will be happy to get something besides candy and cartoon characters. As a bonus, because I had to get this post ready, these valentines are actually done early! 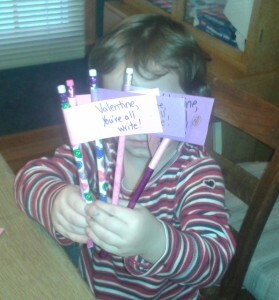 I won’t have to stay up on the thirteenth taping construction paper flags to valentine themed pencils. My husband is so proud. If you’re looking for some creative valentine ideas, check out Family Fun’s website. They have a lot of ideas with and without candy. There are even ideas for teacher gifts and things like that. What about you? Do you make your valentines or buy them? What’s the most creative valentine you’ve ever seen?